These photos of Bassendean Oval were taken in consecutive games between home team Swan Districts and visitors East Perth but they tell contrasting stories. 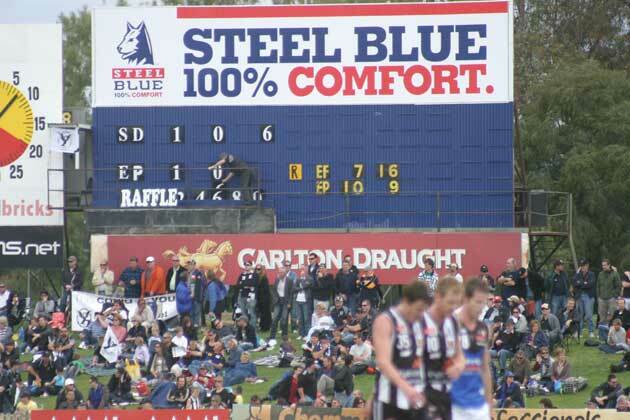 The photo above was seven minutes into the 2010 preliminary final, the game that took the Swans into the famous Andrew Krakouer inspired WAFL grand final. 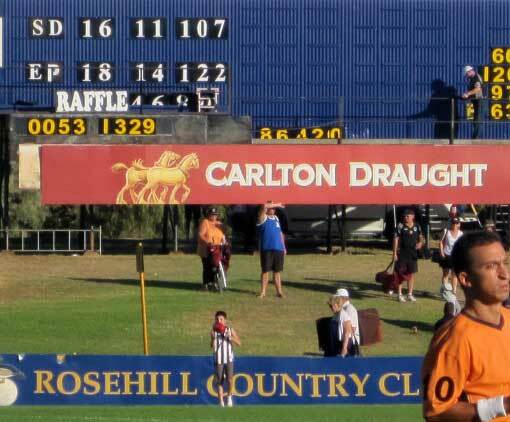 The photo below was round one of 2011 when East Perth beat Swan Districts and the premiers quickly toppled out of contention. Swans are newcomers to the WAFL competition. They joined in 1934 and won their first premiership under Hayden Bunton in 1961. The club has won just eight premierships but have pulled off a hat-trick twice – 1961-63 and 1982-84. The revival of Swan Districts in recent years has been good for the WAFL. Fans of the black and whites have been reborn and crowds have been strong. A glance at AFL lists gives an idea of what’s been coming out of modern Bassendean… Todd Banfield (Brisbane); Chris Yarran, Jeffery Garlett, Dennis Armfield, David Ellard (Carlton); Krakouer, Corey Gault, Kirk Ugle (Collingwood); Clancee Pearce, Michael Walters (Fremantle); Stephen Coniglio (Greater Western Sydney); Jamie Bennell, Neville Jetta (Melbourne); Alex Rance (Richmond); Lewis Jetta (Sydney); Andrew Embley, Nic Naitanui, Murray Newman (West Coast).